Afflictions (also referred to as incapacitations or incaps) are all possible ways to immobilize a ZED. All afflictions stack based on hidden values unique to each ZED called affliction meters, which increase when the ZED is damaged by a weapon with incap power and decrease at a constant rate over time. Each time a ZED is damaged by a weapon with any incapacitation power, the respective affliction meter (be it stun, knockdown, stumble, etc.) increases by a value equal to the incapacitation power of that weapon. Upon reaching the incap threshold the ZED will become afflicted for a short amount of time, varying depending on the Zed and type of affliction. Certain body parts may be resistant or vulnerable to certain types of incapacitation powers, in which case incoming power will be modified by a vulnerability multiplier. Explosive weapons apply incapacitation power based on the target's distance from the center of the blast - the closer a ZED is to the explosion, the more incapacitation power will be applied. Knockdown is a special move where ZED goes into "ragdoll" state. Knockdown followed by getup animations. By any means only 5 ZEDs allowed to be knocked down at time. Once fell on the ground, ZED will be evaluating its getup possibilities within 0.2 second intervals, ZEDs with velocity greater than 100 uu/s or those rigid body is still awake and simulated should skip getup animation untill their next evaluation check. Up to 25 checks (due to code specifics - actually 32) with 0.2s intervals between each two allowed before ZED will be forced to get up back on feet, this results in overall maximum knockdown time of 6.4 seconds. Knocked down ZED will die instantly if it will fall from the height greater than 7.5 meters. ZEDs with dismembered limbs cannot play knockdown / getup animations. Every ZED can be knocked down when player lands on top of its head. Stun is an affliction that causes a ZED to enter a "sleeping" state, during which it will stand in place and not attack. The duration of the stun varies by ZED type. When a ZED's stun duration expires a brief recovery animation will play before it is able to act freely again. Stumble is an affliction that causes a ZED to stagger backwards, temporarily impeding its ability to move and attack. Impacts from different angles will cause different stumble animations, each with its own duration. After playing a stumble animation for a semi-random duration (0.5-0.75 seconds), ZED will be able to interrupt it by taking hit from the weapon which Melee hit power / Gun hit power will be greater than ZED's Melee hit / Gun hit resistance. Additionally ZED should not be in cooldown to applied type of the power, otherwise stumble animation will not be interrupted. Melee hit / Gun hit (aka Hard hits / Medium hits) are ZED's reactions. When "hit" ZED's AI paused for listed amount of time ("AI pause, on melee hit" for Melee hits and "AI pause, on gun hit" for Gun hits). Gun hit / Melee hit can interrupt ZED's special moves (if listed power > ZED's resistance, ZED is not in cooldown and such move can be interrupted by design). Both terms are abstract - firearm can have Melee hit power and Melee weapons can have Gun hit power assigned to them, the only significant difference between them is the duration of the reaction. NOTE: as for the current version ZEDs use "AI pause, on melee hit" timers to pause their AI for the duration of either reaction. Snare slows ZED's movement by 30% (x0.7 multiplier). Snare and Bleeding speed debuffs are multiplicative, total speed mod is 0.7 x 0.7 = x0.49. Poison / Microwave / Fire / EMP affliction causes ZED panic, EMP Disrupt cancels ZED's certain abilities (special attacks, sprinting). Freeze temporary stops ZED's movement. Bleed. Bleeding is a ZED state, when bleeding ZEDs takes more incap power towards its incap meter, moves 30% slower (stack with Snare for total of x0.49 speed multiplier), does 30% less damage (x0.7 multiplier) and attacks 25% slower (animation-wise, as bleeding multiplies the duration of animation by x0.8). Bleed increases amount of the incap power taken by ZED: by default amount of the power given by damage type is "1 + perk incap bonuses", instead bleeding ZED take "1.5 + perk bonuses" amount the weapon powers towards its affliction meter. For the duration of bleed affliction ZEDs shrink in size, however their hitboxes remain the same. ZED affected by bleeding as long as it's stacking meter above the Incap Threshold. Cooldown on this affliction meaning that upon hitting 100 points of bleeding power on ZED's incap meter (not 65 where bleeding start its effects) ZED stops taking any further bleeding power applications until cooldown expires which makes it impossible to maintain constant bleeding. In theory it is possible to avoid cooldown while keep bleeding effect active by keeping ZED's incap meter in range of (65-99), however it is next to impossible on practice. Radial damage sources (e.g. grenades) have their incap powers adjusted according to ZED-to-Explosion proximity. Explosion provides maximum amount of the powers at its epicenter and minimum at the edge. Incap powers scale up / down linearly. Various incap powers can be applied on ZED at the same time, however, when either Knockdown, Stun, Stumble or Freeze incap is IN-PROGRESS (threshold is reached and ZED playing specific animation), the other 3 of these incaps CANNOT appear and for the duration of given incap and ZED DOES NOT accept any incap powers towards these 3. For example, stunned ZED does not take any knockdown, stumble or freeze powers at all. Effect-based incaps (EMP - Burn - Poison - Microwave - Bleed) can co-exist with each other and all other incaps. They can appear along any other incap at the same time, however they do not override ZED animations - instead (for their remaining duration) they start playing right after ZED animation ends. However, these incaps themselves can be overridden by either Knockdown, Stun, Stumble or Freeze. NOTE: ZED that is currently suffering from any effect-based incaps but Bleed DOES NOT accept any Stumble powers. Note: blocking ZED become completely immune to the effects of Knockdown, Stun and Stumble (does not accept incap powers at all). All other incaps during the block getting their powers reduced by 80% (ZED accepts only 20% of the incap powers), power mitigation effect begins after 0.25 seconds since the block move started. Affliction priority (highest first): Knockdown - Stun - Stumble - Freeze - Snare - Melee hit - Gun hit - EMP - Burn - Poison - Microwave. Falling pawns (ZEDs or Humans) may cause damage to other ZEDs or Humans by landing on them (players cannot damage friendly players). Amount of damage depend of falling velocity and mass of both pawns. Damage to take is an integer value of ((1 - Falling Velocity / 400) x Mass of Falling Pawn) / Mass of Pawn That Getting Crashed), note: Falling Velocity is a negative value, maximum falling velocity = 40 m/s (-4000 units / second). After landing on top of pawn's collision cylinder landed pawn will be pushed away by getting extra velocity (including Z-axis) into random direction. ZEDs does not take damage from falling. Game simulates Free Fall and Acceleration of Gravity. Normal in-game gravity acceleration = 11.5 m/s^2. Maximum falling velocity = 40 m/s. from at least H = (13.25)^2/(2x11.5) = 7.634 meters. Damage taken calculated by formula: Falling Damage = Rounddown ((100 x (Player's Velocity - 13.25)) / 13.25). Maximum possible damage from falling = Rounddown ((100x(40-13.25))/13.25) = 201.
up to +/- 5 meters per second towards falling player's velocity in the opposite direction to where player is currently aimed at. Note: Unlike players, ZEDs do not take damage from falling. As a rule of thumb, in order to take DOT ZEDs (and players too) have to lose some of their health in the first place. Damaging armored zones such as E.D.A.R's torso or head should not apply DOT status at all, same goes for players - taking armor-only damage results in no DOT applications. Should the player hit any of the armored ZED's exposed body parts and trigger DOT sequence, the armor is always to take damage over time FIRST, protecting actual health for while it lasts. As with all the other forms of indirect damage, DOT damage getting split between all existing armor pieces for equal parts. Damage over time uses "DOT scale" which is multiplier for initial amount of damage given by weapon / ZED, this amount of the damage will be repeated for the duration of "DOT duration" within intervals of "DOT interval". More than one type of DOT can be applied at time, in such case each DOT type will be having its own damage, duration and interval. If DOT of same type applied at target (for example "new" Fire vs. "old" Fire) game will check the effectiveness of "new" DOT in terms of total damage (total damage = DOT damage x (DOT duration / DOT interval)) comparing to "old" DOT. If "new" DOT will be more "effective" then it will be applied (including new and updated damage, duration and interval values) otherwise "old" DOT will be used for its remaining duration. For example DOT from Flamethrower direct hit in most cases will be more "effective" than DOT from splash damage so it will overwrite splash DOT and vice-versa - DOT from splash damage will be "less" effective than DOT from direct hit so it will not overwrite remaining direct hit DOT. Field Medic's Hemogoblin weapon is an exception to the rule above. Each projectile of this weapon applies its own DOT, with its own (yet the same) damage, duration and interval making it the only weapon that can spawn multiple instances of the same DOT type. Amount of DOT ticks and DOT duration / interval: the first DOT tick is not instant but rather kicks-in only after <DOT interval> seconds. On top of that DOT wears off completely when <DOT duration> value become less than <DOT interval>. For example, Caulk n' Burn (DOT duration = 1.7s, interval = 0.4s) has only 3 DOT ticks on it: tick 1 starts at 1.7 - 0.4 = 1.3s mark, tick 2 comes next at 1.3 - 0.4 = 0.9s mark, tick 3 takes place at 0.9 - 0.4 = 0.5s mark. Even though there is a space for tick 4 which could have happened at 0.1s mark, it actually does not happen because DOT wears off 0.1s later after tick 3 (by this time DOT duration become < DOT interval). Note that DOT calculation takes on account a DEFAULT damage value of the weapon and does not depend on amount of the actual (initial) damage taken by ZED. For example, Bloat vs. Spitfire Revolver: Bloat is resistant to ballistic handgun damage of the Spitfire and only takes 35%, 40x0.35 = 14. This, however, does not mean that DOT (which is 80% of the Spitfire damage) will be 14x0.8 = 11. Actual DOT is % of the default weapon damage which is 40x0.8 = 32. Since Bloat is neutral to fire, 32 is exact amount of damage given to it per DOT tick. This means that damage types of the DOT and its causer are treated separately in terms of damage calculation. Player takes twice less damage and affected by twice less time from Fire DOT when healed (damage x 0.5, duration x 0.5). Berserker affected by any forms of DOT for 20% less time than any other perk. Player cannot die during the trader time. During the trader time player takes no damage at all - all incoming damage is being set to 0. Doors has weld integrity (can be restored by Welder) and maximum health (cannot be restored). Regardless from game difficulty ZEDs do same amount of the damage to door (damage amount is ZED-specific). Support has passive skill that allows to repair destroyed doors. Each welder attack restores 7 points. Door will be restored once it accumulate total of 255 points. When door is welded, ZEDs may try to attack it or will try to find another path to the players. Generally the higher door weld integrity is, the more ZEDs attacking or pending to open it already - the greater chances for ZEDs to try to find another path. Depending on amount of ZEDs attacking the door it takes additional damage. With each next attacker door takes 10% more damage per single attack, up to 100% more damage (x2 damage multiplier) when it being attacked by 10 ZEDs at once. Bosses have an ability to destroy closed unwelded doors by sprinting (bumping) into them. Doors have 2 types of the health. Max Health cannot be restored, Weld Integrity restored by Welder. Door will break when either - Max Health or Weld Integrity become zero. Welder can restore or erase Weld Integrity HP. Support's passive skill increases Door HP to restore / erase perWelder's attack interval by up to x1.75 (+119 / -192). it only restores 60% (x0.6) of the regular HP / tick value. Support can repair doors at rate of 7 points / welder attack. Door will be restored upon accumulating a total of 255 points. Amount of the Dosh player getting on kill depend on the Base Dosh Reward, Dosh Kill modifier, Wave Length modifier, percentage of the damage dealt to ZED and finally on Game Length Dosh Scale modifier. Base Dosh Reward: Clots (all) - 7; Bloat - 17; Crawler - 10; Gorefast - 12; Stalker - 15; Husk - 17; E.D.A.Rs - 17; Siren - 25; Scrake - 75; Fleshpound - 200, bosses - 500. PvE ZEDs has their own Dosh rewards (actual numbers at the respecive wiki pages). Dosh Kill modifier: Normal - x1.2; Hard - x1; Suicidal - x1; HOE - x0.9. Wave Length modifier: 1 player - 1; 2 players - 2; 3 players - 2.75; 4 players - 3.5; 5 players - 4; 6 players - 4.5. Game Length Dosh Scale modifier: Short game - x1.75; Medium game - x1; Long game - x0.8. 1. Calculate Adjusted Dosh value = Base Dosh Reward x Dosh Kill modifier x (Amount of the players / Wave Length modifier) x Game Length Dosh Scale modifier. Outcome is a FLOAT variable. 2. Calculate Score Denominator value = Adjusted Dosh / Total Damage Taken By ZED. Outcome is a FLOAT variable. 3. Calculate player's dosh сut that depends on % of inflicted damage: Earned Dosh = Round (Damage Inflicted By Player x Score Denominator). 4. If player has assisted in ZED kill but did not kill it themself, calculate Assistance Dosh value = Round (Earned Dosh x Perk Assist Dosh Modifer). Relevant for Sharpshooter which is the only perk in game that gets 10% more dosh (x1.1 multiplier) for assists. % of Damage Dealt in the formula above implies how much damage exactly each player inflicted to ZED compare to overall amount of the damage taken by this ZED by the moment of its death. Sharpshooter gains 10% more dosh for assists (x1.1 multiplier to Earned Dosh). Short game: wave1 - 550, wave2 - 650, wave3 - 1200, wave4 - 1500. Medium game: wave1 - 450, wave2 - 600, wave3 - 750, wave4 - 800, wave5 - 1100,wave6 - 1400, wave7 - 1500. Long game: wave1 - 450, wave2 - 550, wave3 - 750, wave4 - 1000, wave5 - 1200,wave6 - 1300, wave7 - 1400, wave8 - 1500, wave9 - 1600, wave10 - 1600. With the next respawn player will get highest amount of Dosh out of two possible values -Minimum or Maximum respawn Dosh. End wave Dosh bonus is a total amount on Dosh earned by all players during the last round divided between all living players into the equal parts. Game Conductor is a system that dynamically adjusts difficulty of the game based on how well player's team doing. Difficulty management (change of values) happens within 1 second intervals. Game Conductor is quite complicated mechanism. Many factors have impact on it - average level of the team, average accuracy on bodyshots / headshots, ZED lifespan. Evaluation happening within 1 second intervals. Overall weights of certain criteria: Average Perk level - 0.25, Average Accuracy - 0.25, ZEDs Lifespan - 0.5. Game Conductor will stop its actions completely and all the values will be automatically lowered down to the minimum if average health of the team will become less than 50% OR for the next 15 seconds after one of the teammates had been killed OR simply when it turned off (in such case overall performance of the team will be considered as 0). Normal difficulty: Current spawning interval can be slowed down by up to x1.25 or raised up by up to x0.75. Hard difficulty: Current spawning interval can be slowed down by up to x1.25 or raised up by up to x0.75. Suicidal difficulty: Current spawning interval can be slowed down by up to x1.25 or raised up by up to x0.5. HOE difficulty: Current spawning interval can only be raised up by up to x0.75. Additionally current spawning interval of the ZEDs depends on various factors (more info on Notes Tab, "ZEDs - Spawn intensity" mechanics). 2. AI Movement Speed (PvE only) AI movement speed on the current difficulty will never be higher than movement speed on the next higher difficulty. Normal difficulty: up to -2.5% / +2.5% to the base speed mod of the Normal difficulty. (±50% of Normal-to-Hard diff). Hard difficulty: does not go down / does not go up. (±50% of Suicidal-to-Hard diff, since there is no difference). Suicidal difficulty: does not go down / does not go up. (-50/+65% of HOE-to-Suicidal diff, since there is no difference). HOE: does not go down / does not go up. Additionally current movement speed of the ZEDs randomized within -10% / +10% range. (more info on Notes Tab, "ZEDs - Movement speed" mechanics). 3. ZED Attack Intensity (PvE only) When overall performance of the team become "0", ZEDs will enter low attack intensity mode where they will start using pre-set cooldowns between their attacks. On HOE game or at any boss wave ZEDs do not enter this mode. Low attack intensity mode duration: Normal - 10s, Hard - 8s, Suicidal - 6s, HOE - 5s, Cooldowns - 12s / 14s / 16s / 18s. Additionally low attack intensity mode will occure in solo game if player with less than 95% HP being surrounded by at least 2 ZEDs within 2.5 meters, in this case duration of effect - 10s. Overall attack cooldowns: Clots / Crawler / Stalker - 2s, Bloat / Gorefast - 3s, Husk - 2s for melee, +25% time between fireball and flamethrower attacks (note - these attack already have different cooldowns depending on the difficulty and are also randomized by up to -1s / +1s), Siren - 7s, Scrake - 5s, Quarter Pound / Fleshpound - 5s. 4. ZED Health Mod (PvP only, only player-controlled ZEDs) Based on average level of the team (where all 0s is minimum and all 25s is maximum) ZEDs in PvP games have their health adjusted in the range of (0.85 - 2). 5. 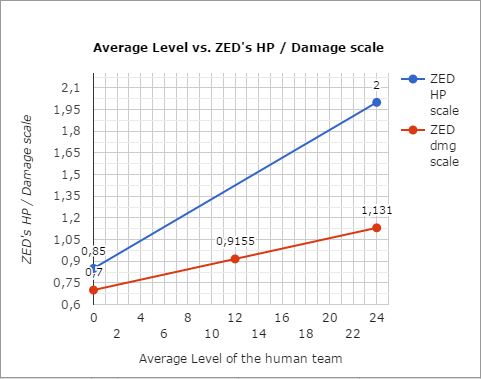 ZED Damage Mod (PvP only, only player-controlled ZEDs) Based on average level of the team (where all 0s is minimum and all 25s is maximum) ZEDs in PvP games have their damage adjusted in the range of (0.7 - 1.131). In PvP games player-controlled ZEDs have their HP and Damage multipliers scaled based on the Average Level of the human team. Healers apply health instantly but regeneration takes time. When healed, Player regenerate health at rate of 1 HP per 100ms (making it 10 HP per second), this rate is equal for all Perks. Amount of health in Player's "health to regenerate" pool will never be more than Maximum Health - Current Health. Each next iteration of healing updates "health to regenerate" pool by its value. Healing decreases damage and duration of fire DOT by half. Amount of the Dosh given for healing calculates as Earned Dosh = (Given Health / Player's Max Health) x 60, where Given Health is amount of health given by healers, Given Health adjusted depend on healer and perk but it will never be more than Maximum Health - Current Health. Amount of the item pickups that can be active at time depend on Game Difficulty and Current Wave number. A group of items (weapons / armors / ammo boxes) will be spawned upon starting the game. Locations for these items are random (chosen from all possible pre-set locations). Items will not change their content or location until the next wave. Each time item picked up the countdown for new item begin (countdown based on amount of living players). Items (weapons or armors) will be replaced by items (weapons or armors), ammo boxes will be replaced by ammo boxes. Respawn time depend on amount of the living players. All possible items (Armor, AR-15 Varmint Rifle, SG 500 Pump-Action, Crovel Survival Tool, 9mm Pistol, 1858 Revolver, Winchester 1894, HMTech-101 Pistol and MP7 SMG) has equal chances to appear upon spawning. Amount of ammo given for certain weapon depend from the weapon's ammo pickup scale. Amount of the item / ammo pickups depend on the current wave. With each next wave amount of the possible item / ammo pickups multiplied by the (Wave Number / Max Wave Number) value and rounded down. At least one ammo box will be active from the beginning of the game and at least one item pickup will be active from the wave 2 (any length) and further. During the boss wave there will be maximum possible amount of the ammo pickups (technically, maximum possible ammo pickups - 1). Note: Unlike ammo, active item spawn points shut down (for the entire game) when items taken. DieSector All 6 weapon / 10 ammo spawns are always active, respawn time - 90s / 160s. Krampus Lair All 10 weapon / 19 ammo spawns are always active, respawn time - 150s. Nightmare All 17 ammo spawns are always active, no item pickups, respawn time - 45s. Power Core All 25 ammo spawns are always active, respawn time - 45s. Weapon pickups, per difficulty: 4 / 3 / 2 / 1. Weapon pickups follow the "normal" rules. Santa's Workshop All 10 weapon / 21 ammo spawns are always active, respawn time - 150s. The Descent All 23 ammo spawns are always active, no item pickups, respawn time - 45s. Movement speed depend on amount of the health and carrying capacity. Player can lose up to 15% of the movement speed depending on their current HP. Movement speed decreases linearly from 0 to -15% based on amount of the player's health: 100+ HP = no penalty, 0 HP = -15% speed loss. Having 100+ HP results in no speed loss at all. Player can lose up to 8% of the movement speed when carrying 15/15 (or 20/20) blocks of weight. Movement speed decreases linearly. Hard melee attacks causing Player to pause current movement input for 100ms, as a result there is slight movement pause prior to each of these attacks. ADS-walking / crouching / both-at-the-same-time speed is 40% of the player's default walking speed (i.e. unaffected by health loss and extra weight). Gunslinger's Steady skill multiplies ADS-walking speed by x2, SWAT's Tactical Movement multiplies both ADS-walking and crouching speed by x2.5. Sharpshooter's Stability skill instead multiplies player's walking / sprinting speed by x1.5 but only when crouching (hence x0.4 multiplier should be applied as well) making Sharpshooter the only perk whose extra movement speed depend from the health and weight. Additionally while ADS-walking speed of the SWAT is independent from health and weight, its crouching speed is actually depends (only) from the HP loss. (x0.4 of the default walking speed, i.e. unaffected by health loss and weight carried). Current movement speed (walking / sprinting) depends on two factors: Low Health Speed Penalty and Weight Mod. Low Health Speed Penalty increases linearly upon loosing health, -0.15% per 1 hp loss. For example at 75HP it will be 0.0375 (-3.75%), at 50HP it will be 0.075 (-7.5%), at 1HP it will be almost 0.15 (-15%). Weight Mod increases linearly from 0 (when empty) to 0.08 (-8%) (when fully loaded). Each block of weight increases Weight Mod by approximately 0.005 (by 0.004 for perks with 20 blocks of weight). Berserker and Survivalist get their speed bonuses only while holding melee weapons. Field Medic, Gunslinger and Sharpshooter (with Marksman skill) have their speed bonuses all the time. Sharpshooter's Stability: walk / sprint speed x1.5 (only when crouching, hence x0.4 as well). 9mm Pistol, Knife, Medical Syringe and Welder have no weight at all. Melee weapons have Parry Strength and ZEDs have Parry Resistance. The incoming attack can only be parried with the weapon that has the same or the greater Parry Strength than ZED's Parry Resistance. This rule DOES NOT apply at the damage mitigation process - parry window of the melee weapon lasts for the duration of its "brace-in" animation, any ZED attack encountered during this time will have its damage multiplied by weapon's Parry damage multiplier OR if "brace-in" animation is finished already - by weapon's Block damage multiplier. This means that damage reduction happens regardless from the Parry Strength / Parry Resistance levels however unlike blocking, parrying an attack causes ZED to play stumble or parry-stumble animation. Some of the ZED's strong attacks (indicated with the red glow around the arms) cannot be parried in terms of stumbling ZEDs back but the damage mitigation for these attacks will still be there. After player leaves the block state there is 0.5 seconds cooldown before he/she can initiate a new block/parry sequence. Whenever during the wave time there will be no spare AI ZEDs to spawn, human-controlled ZEDs will be affected by anti-griefing system that will punish them for avoiding engagements. After spending 30 seconds without dealing or taking damage within 2 second intervals they will be taking damage that is 5% of their maximum health. An optional tasks rewarding players with Dosh, XP and Vosh. In Survival mode on official maps starting from wave 2 there is 35% chance for an optional "Stand Your Ground" objective to appear. Upon receiving such objective players will be having 20 seconds (usually) to make their way into the designated area of the map and defend it from ZEDs. Not getting into location in time, having too many ZEDs in it or not having enough players in the area will result in penalties. For every second of lacking players, prommised dosh reward will be decreased by 5, for having too many ZEDs in it - by 10. To maintain the area in the valid state there should be at least A players on B man server (total players - players needed) : 1p - 1, 2p - 1, 3p - 2, 4p - 2, 5p - 3, 6p - 3 and no more than C ZEDs (total players - ZEDs in area to start penalty): 1p - 4, 2p - 4, 3p - 4, 4p - 3, 5p - 2, 6p - 2. Rewards scale with the game difficulty and how well the area was secured during the wave. Rewards based on percentage of earned Dosh compare to the Promised Dosh value. Reward % = (Final Dosh / (Promised Dosh). Dosh Scalar: Normal - x1.2, Hard - x1, Suicidal - x1, HOE - x0.9. XP Scalar: Normal - x1, Hard - x1.3, Suicidal - x1.75, HOE - x2. Vosh Scalar: Normal - x1, Hard - x1.3, Suicidal - x1.75, HOE - x2. Note that all the values above are the subject of change as they all set manually, per map and location. For example SYG objectives on the "Krampus Lair" map have different requirements for holding areas to stay valid and on the "Spillway" the Dosh penalty for having too many ZEDs / too few players in the marked area is only 1 / 5 points per tick. Whether weapon will decapitate or will it instakill, depending on amount of the given damage and remaining body health. ZEDs can only be decapitated when amount of their head health will be lesser than amount of the damage given by weapon. When landing a head blowing shot the extra damage to ZED's body health will be done. Essentially ZED takes extra damage which is at least 25% of its maximum health plus the weapon damage itself. If ZED resistant or weak against the damage type used for decapitation, initial weapon damage will be adjusted (increased or decreased), then this damage will be added to 25% body HP value and this whole sum will be adjusted (increased or decreased) once more. Decapitated ZED: stops sprinting / doing special move (attack, evade, taunt etc.) / cloaking, getting slower rotation rate, limited to headless attacks. Whenever during the wave time there only 5 ZEDs remains, following ZEDs will enter frustration mode. In this mode ZEDs will be forced to sprint regardless of their normal sprint conditions. It takes them random (2.5-5) seconds to enter such mode. Scrakes, Fleshpounds and bosses cannot be frustrated. ZEDs spawned during the boss wave are always frustrated. ZED Time happens on killing ZEDs or killing players. ZED Time slows the world to 20% of its normal speed, ZED Time duration = 3 seconds, ZED Time is a timer, ZED Time can only be reset (not extended). ZED Time slows the world to 20% of its normal speed (i.e. by 5 times). ZED Time duration - 3 seconds. ZED Time is a timer (float value 3.0000). It constantly goes down to 0. ZED Time cannot be extended by certain amount of the seconds. Instead it resets back to 3.0000. Non-commando perk can reset it once. Commando can reset it up to 6 times (at level 25). ZED Time has greater chances to appear in time. For next 30 seconds since the last ZED Time - normal chances (x1), between 30-60s - twice better (x2), if 60s passed without ZED Time - four times better (x4). Minimum interval between 2 ZED Times - 10 seconds. Cooldown begin at the very beginning of each ZED Time. DOT-based damage types (e.g. fire) do NOT trigger ZED Time events. ZED Time can affect players either partially or fully. If ZED Time appears and there is no players or ZEDs nearby, player will enter ZED Time partially - world time will be slowed down but player will retain full movement speed. Player will enter ZED Time fully as soon as he/she spot/get spotted by another player or ZED or perform a shot or attack. There are different visual and sound effects for entering either of ZED Times. When ZED Time kicks in, variable ZedTimeExtensionsUsed (which assigned to the "world" and not to the certain player) will be reset to 0. On each next kill during the time ZED Time active the game will be checking how many times player can extend (reset) it - by default each class has ZedTimeExtension of 1, Commando has it up to 6 at level 25. If amount of the ZedTimeExtensionsUsed variable will be less than player's ZedTimeExtension, the ZED Time will be reset and ZedTimeExtensionsUsed counter will be increased by one. In other words first ever extension can be performed by any perk but all further - only by Commando. By any means only 6 ZED Time extensions can be used in single ZED Time chain. Certain skills provide ZED Time resistance. By default actions (e.g. shooting, moving, reloading etc.) has no ZED Time resistance at all (weapon equipping and putting down has ZED Time resistance of 35%). These skills add listed % of how much certain action has to be resistant to slow-mo effect - 0 (0%) - no resistance, 1 (100%) - full ZED Time resistance. ZED Time slows the world to 20% of its normal speed (0.2 vs 1), subject of change which being modified by skills is for how much world slowed: 1 - 0.2 = 0.8 or 80%. If skill gives full ZED Time resistance, the action will be happening at rate of 0.2 + 0.8 x 1 = 1, i.e. at full speed, if skill gives 50% resistance, the action will be happening at rate of 0.2 + 0.8 x 0.5 = 0.6, so when everything will be slowed to 20% (by 5 times) this action will only be slowed to 60%, i.e. by 1.67 times. Weapon swaps has ZED Time resistance of 35%. When ZED Time occurs weapon swapping slowed by 1 / (0.2 + 0.8 x 0.35) = 2.08 times. Commando's Tactician skill adds additional 30% to the base 35% resistance value making weapon swaps in ZED Time only 1 / (0.2 + 0.8 x (0.35 + 0.3)) = 1.39 times slower than if it would be in real time. Despite the fact that perk description says "+X% of speed", it does not directly change the speed but instead it decreases duration of the attack / reload animation by listed value. For example -25% duration of the reload animation will actually increase its speed by 1 / 0.75=1.33 or 33% and -50% of the melee attack animation will increase its speed by 1 / 0.5 = 2 or 100%. This rule also applied on ROF changing skills - 25% faster firing actually means that it takes 25% less time to perform subsequent shot which increases Rate Of Fire by 33.3%. Combination of few speed bonus applied at same time is a result of multiplication, not a result of sum. For example if two speed bonus (-15% and - 30%) applied at time the final speed bonus will not be -45% but instead it will be (1 - 0.15) x (1 - 0.3) = 0.595 = 41.5% less time to play the animation. This increases actual speed by 1 / 0.595 = 1.68 times. Note: Upgrade bonuses take place before the perk calculations. Each upgrade is a multiplier toward weapon's DEFAULT damage value, it overriders (does not stack) the previous upgrade: 20 x 1.1 -> 20 x 1.2 etc. Upgrade calculations imply interger values: 15 x 1.1 = 16.5 = 16. Upgrades do NOT improve Bash damage. Upgrades do NOT improve Ground Fire damage of the flame-based weapons but DO improve DOT and Splash damage. With each next damage bonus associated with the perk, the base weapon damage will be increased by (base damage) x damage modification value. Sum of all damage adjustments will be either ROUNDED or ROUNDED UP - ROUNDED for Berserker, Demolitionist, Firebug, Survivalist and SWAT and ROUNDED UP for Commando, Support, Gunslinger and Sharpshooter. Example 1: Commando + SCAR-H Assault Rifle + level 25 passive bonus + Hollow Point Rounds damage bonus: Damage = Roundup (55+55x0.25+55x0.3) = 86, where 0.25 is a passive damage modifier and 0.3 is a modifier of Hollow Point Rounds skill. Example 2: Demolitionist + RPG-7 (impact + explosion) + level 25 passive bonus: Damage (impact) = Round (150+150x0.25) = 188. Damage (explosion) = Round (750+750x0.25) = 938. Total damage = 188+938 = 1126, where 0.25 is a passive damage modifier. Certain skills modify magazine size of the weapon AND / OR its spare ammo pool. Magazine size modification increases amount of the ammo in each magazine. This extra ammo is NOT being taken from maximum spare ammo pool. Spare ammo modification does not imply magazine size of the weapon, it only modifies amount of the maximum spare ammo. Certain skills also increase the ammo pool of 9mm Pistol(s). Firearms can utilize both - hitscans AND / OR projectiles. Shotgun pellets, grenades, rockets, Eviscerator's saw blades, Crossbow's bolts, AF2011-A1(s)'s bullets and healing darts are always projectiles. ARs, SMGs, Rifles and pistols are hitscans unless in slow-mo, where they become projectiles. Flame-based weapons use sprays - physical objects that do damage when collide with targets. Ballistic-explosive projectiles can collide with both - ZED's hitzones and collision cylinder. Weapons that do two types of the damage (ballistic and explosive) at same time (M79, M203, RPG-7 for example) use BallisticExplosive type of projectiles. These projectiles can collide with either ZED's hitzones (e.g. head, arms, legs, torso) or with ZED's collision cylinder - an outter cylinder-shaped "hitbox" that defies ZED's size in the world. If projectile misses all the hitzones it will attempt to collide with the collision cylinder. In such case damage will be dealt to the nearest (from the explosion epicenter) hitzone. BallisticExplosive projectiles do impact damage at any range. Generally damage types determining following: visuals (gore, dismemberment, amount of blood, impulse / velocity given to live or death pawns, impact effects, obliteration etc. ), DOT existence (its duration, amount and interval) and weapon powers. Ballistic = Normal bullet or projectile, Slashing = Edged melee weapons (plus Eviscerator's projectile), Bludgeon = Bludgeoning weapons (plus weapon buttstock), Toxic = Poisoning damage (Medic Grenade, healing darts), Explosive = Explosives, Piercing = Frag / Nail Grenade shard (plus stab attack of edged melee weapons), Fire = Flame-based weapons, Microwave = futuristic weapons such as Microwave Gun, Killerwatt and Helios Rifle, EMP = EMP Grenade, Freeze = Freeze Grenade. Some damage types associated with certain perks. Association could be meaning that this perk will be getting damage or power bonuses for weapons that use this damage type. Association also used in certain functions that modify different weapon attributes. Damage types extend each other. For example damage type "Fire" is parrent damage type for "Fire_FlameThrower". If perk associated with parent damage type it also associated with all of its sub-damage types unless sub-damage type listed to have another perk to belong to. Most explosives lose their effectiveness (damage) on the distance from explosion epicenter. Final Damage = Base Damage x ((Proximity Percentage) ^ Falloff value). Example: Explosion (damage - 100, radius - 10 meters) vs. ZED (2 meters away from the epicenter) : 1. No falloff - ZED will take full damage. 2. Linear falloff - ZED will take ((10-2)/10)x100 = 80 points of damage. 3. Exponential falloff (power of 0.5) - ZED will take (((10-2)/10)^0.5)x100 = 89 points of damage. 4. Exponential falloff (power of 2) - ZED will take (((10-2)/10)^2)x100 = 64 points of damage. 5. Exponential falloff (power of 3) - ZED will take (((10-2)/10)^3)x100 = 51 points of damage. Explosives do not trace hit zones. Player cannot damage certain ZED's limb with an explosion. Hit detection happens by checking whether explosion sphere does or does not make a contact with ZED's collision cylinder. Since explosions do not trace hit zones it is not possible to apply certain explosion power (knockdown, stun etc.) to certain body part. Instead all explosion powers are being applied to ZED's "Torso" body part. However damage inflicted by explosion is a subject of change depending on the victim's Exposure Percentage. By default uncovered victim (player or ZED) takes full damage (Exposure Percentage = 1). Victim covered behind the obstacles has Exposure Percentage of at least 0.3 plus 0.4 if its head is NOT covered plus 0.15 for each of UNCOVERED leg. On explosion damage to take will be multiplied by the Exposure Percentage value. Fire-spraying weapons has various sources of the damage. Direct hits with the fire-spraying weapons cause FLAME DAMAGE which is applied at the certain rate of fire. At the same time at same rate all targets within certain proximity (SPLASH DAMAGE RADIUS) from the initial target take "indirect" damage - SPLASH DAMAGE. Immediately after taking damage and for some time after ZEDs start to suffer from the DAMAGE OVER TIME (DOT) effect. Afterburn has its own duration and interval to apply the damage which are specific for different sources of fire damage. Amount of the damage per afterburn tick is a % of initial damage - amount of the damage per DOT tick after taking direct hit (as well as interval and duration) will be different from amount of the damage per tick after taking Ground Fire damage. Flame based weapons are also capable of creating either GROUND FIRE or RESIDUAL FLAME (depend on the weapon) - both are small bonfires that remain of the ground for certain amount of the time. Ground Fire / Residual Flame applied at the different rate, has its own damage, radius and falloff as well as its own afterburn attributes. Two Ground Fire sources cannot spawn on top of each other unless there would be at least 0.25 meters between them. In most cases each time ZED takes damage its DOT parameters are being reset, however there might be exceptions. See Gameplay - Damage over time (DOT) for more details. Much like explosives, flame-based weapons such as Flamethrower or Microwave Gun do not trace any hit zones but torso, it is not possible to hit any other hit zones with this kind of weapons. Note that during the post-firing period (read below) flames DO perform zone tracing in a specific way - for the short period of time, when "flame ending" animation still plays it is become possible to headshot ZED or if this ZED wears armor which normally absorbs all indirect damage to inflict damage to any of its exposed body parts, such as to hit Rioter's legs. Sprays of the flame-based weapons have post-firing lifetime where they keep doing damage for a short period of time after player releases the fire button. It takes 0.35 seconds to finish the "flame ending" animation, during this time weapon will be doing damage without consuming ammo. "Flame ending" animation will be canceled and ended earlier should the player trigger new "flame start" animation. Amount of the damage dealt by melee weapons depend on tracer direction. Damage dealt by the melee weapons depends on attack direction and on how well melee tracer connects with the ZED's body - vertical strikes do more damage while horizontal strikes do less damage but have better AOE. Pure horizontal (left-to-right, right-to-left) strikes do never more than 75% and never less than 50% of the base weapon damage depending on the view angle - the closer target to player's view center the more damage it will take. Weapons have Penetration Power and ZEDs have Penetration Resistance. If weapon has Penetration Power its bullet or projectile can pass through ZED's body as long as Penetration Power will be greater (greater, not equal) than ZED's Penetration Resistance. Once passed through ZED, Penetration Power of the weapon will be reduced by amount of the ZED's Penetration Resistance. As long as it greater than Penetration Resistance of each next ZED it will continue to penetrate. Support's passive skill adds 0.2 points to the weapon's Penetration Power per level. All players have penetration resistance of 1. With each next penetration, damage gets reduced by amount of the Penetration Power left compare to its base value. For example - Shotgun (Penetration Power = 2) penetrate a Clot (Penetration Resistance = 1). Penetration Power that remains is 2 - 1 = 1. Damage that will be done to the next Clot is 1 / 2 = 0.5 or 50% of the initial weapon damage. This means that penetration-related skills not just increase amount of the bodies weapon can penetrate but also decrease the damage reduction for each subsequent penetration kill. Support's Penetrator and Gunslinger's Line 'em Up skills remove the damage penetration curve completely, skill owners will always be doing full damage to ZEDs regardless from amount of the penetrated bodies. However Penetration Power loss still remains. Damage reduction on penetration happens after calculating upgraded weapon damage but before calculating damage to ZED: Calculate upgraded damage -> Reduce damage on penetration (Damage = Rounddown (Damage x (Remaining Penetration Power / Initial Penetration Power)) -> Calculate damage to ZED ("ZEDs - Damage to take" mechanic). Amount of the recoil and bullet spread depend on player's stance. Every weapon has its own predefined range of the values - maximum and minimum pitch and yaw. Each time weapon fired, game picks random values from that range and moves player's POV into these coordinates. It takes different amount of the time (weapon-specific Recoil Time) to finish the move. Generally Recoil Time is shorter than weapon's fire interval so every recoil application could apply its full move without overrides from the subsequent recoil applications. The faster weapon fires, the bigger max / min recoil values and the shorter Recoil Time it has - the more overall and more "spike"-ish recoil will be. Maximum and minimum pitch and yaw range to pick values from is affected by recoil modifiers - it can either be increased with the recoil modifier greater than 1 or decreased otherwise..
Recoil modifiers are multiplicative - player using 9mm Pistol while crouching and hip-firing will be having recoil modifier of 0.75x1.75 = 1.3125. Recoil for shooting while jumping / falling will also take on account modifiers for hip-firing and jogging - SCAR-H Assault Rifle will be having recoil modifier of 1x1.75x1.5 = 2.625. Lowest possible recoil can be achieved by crouching stationary and aiming down the sights. Recoil modifying skills and bonuses multiply final recoil modifier (after taking on account falling, walking or jogging, crouching and hip-firing modifiers) of the weapon by listed value. Player stances that has impact on weapon recoil: "crouched" - player is ducking, "falling" - player is airborne (jumping or falling), "hip" - player hip-firing (without ADS-ing), "jogging" - player moving or crouching without ADS-ing, "walking" - player moving or crouching while aiming down the sights. Spread is a random bullet or projectile deviation from the player's initial aiming point. Spread values listed at weapon pages are NOT measured in angles. Spread calculation is a complicated process involving rotators (structures to store X, Y, Z aiming coordinates) and scalar products of vectors. An example below is a conversion of spread factor of Tommy Gun (0.024) into degrees assuming only Y-axis (i.e. how much bullet deviates to the right or left from the actual aiming point). Note that this is abstract example as it only implies one axis with X and Z axises being skipped. Each time weapon fired game picks random float variable RandY = FRand() - 0.5, meaning that its range will be within (-0.5, +0.5). "-" and "+" defy in which direction from the player's POV bullet should move. For simplicity sake let RandY always be +0.5 which is the highest deviation bullet can has while moving "right" from the player's POV. Y-axis spread is a scalar product of two vectors (0, 1, 0) and (0, RandY x CurrentSpread x 1, 0). CurrentSpread (assuming that player hip fires while standing) is 0.024, RandY is 0.5. Vector1 x Vector 2 = 3 / 250 = 0.012 radians which is 0.012 x (180 / Pi) = ~0.69 degrees. Spread modifiers of CurrentSpread in the example above do stack up together. Maximum spread modifier is 1, minimum is 0.5x0.75 = 0.375 (while crouching and aiming down the sights). Shotguns do not change their spread with the player's stance change. HX25 Grenade Pistol note: Unlike other multi-projectile weapons, this weapon has its spread profile adjusted to be more predictable (circle-shaped). One of the pellets of this weapon is always dead-center. There are different reload animations and some animations can be sped up. There are normal reloads and "elite" reloads. Duration of "elite" reload animation is shorter and weapon-specific. Whenever player reloading there is separate timing for updating ammo counter and for allowing to cancel the reload animation. If player managed to cancel reload (by other means, e.g. weapon switching) before reaching the time that it takes to update ammo counter the reload will not be completed. Passive skills that increase reload speed actually decrease the duration of reload animation. For example Firebug's 20% reload speed bonus actually means 1 / 0.8 = 25% faster reloading. Some weapons (mostly ones that hold only one bullet / projectile chambered at time) have a "force reload" attribute which is an artificial delay that needs to expire before the weapon will be automatically reloaded. It should be noted that even without "force reload" value every weapon has a short delay (fire interval) before it can be reloaded as firstly fire interval needs to be finished so weapon could leave "firing" state. Fire interval is a delay between every two shots fired by weapon. Upgrades improve various aspects of the weapons such as damage, handling or ammunition. Damage: Base damage of the weapon is being multiplied by X value. Does NOT work with the ground fire and residual flames. Calculation of upgraded damage takes place before perk bonuses, ZED's hitzones and resistances (see "ZEDs - Damage to Take"). Outcome rounded down to INT. Magazine capacity: Increases base magazine capacity of the weapon. Calculation takes place before perk effects. Outcome rounded down to INT. Spare ammo capacity: Increases spare ammo capacity of the weapon. Calculation takes place before perk effects. Outcome rounded down to INT. Spread: Improves bullet deviation from the aim point. Does NOT work with shotguns. Calculation takes place before taking on account aiming, moving and crouching spread adjustments (see "Weapons - Recoil and spread"). Outcome is a FLOAT variable. Penetration: Increases initial penetration power of the weapon. Calculation takes place before perk effects. Outcome is a FLOAT variable. Explosion radius: Increases AOE radius of the projectiles. Does NOT work with the ground fire and residual flames. For ballistic-explosive projectiles calculation takes place after perk effects. Outcome is a FLOAT variable. Reload rate: Reload time of the weapon is being multiplied by X value. Calculation is multiplicative with the perk effects, e.g. reload rate of x0.9 will stuck with lvl 25 Firebug's passive reload rate of x0.8 for a total of 0.9 x 0.8 = x0.72 of the normal weapon reload time which will increase reload speed by 1 / 0.72 = 1.39 times. Recoil: Base recoil modifier of the weapon is being set to X value. Calculation takes place before taking on account stance modifiers (falling, walking or jogging, crouching and hip-firing) and perk effects (see "Weapons - Recoil and spread"). Melee rate: Melee animation time is being multiplied by X value. Calculation is multiplicative with the perk effects, e.g. melee rate of x0.9 will stuck with lvl 10 Berserker's Butcher or Vampire rate of x0.8 for a total of 0.9 x 0.8 = x0.72 of the normal melee animation time which will increase melee speed by 1 / 0.72 = 1.39 times. Affliction power: Increases initial given weapon power of the weapon. Calculation takes place before perk effects. Outcome is a FLOAT variable. Heal amount: Increases amount of the health to apply by healer. Calculation takes place before perk effects. Outcome rounded down to INT. Heal recharge: Time to fully recharge the healer is being multiplied by X value. Calculation takes place before perk effects. Outcome is a FLOAT variable. Block / parry damage mitigation: Block / parry damage multiplier of the weapon is being multiplied by X value. This decreases damage to take even further, e.g. mitigation scale of x0.9 on top of Zweihander's parry scale of x0.4 will result in all damage from parried attacks to be multiplied by 0.9 x 0.4 = x0.36. ZEDs can be aggressive not just to players but also to each other. Along the complicated mechanism of choosing the target to chase, ZED might become aggressive to the player whenever in single attack it takes damage which is at least 10% of its maximum health. It is not necessary for ZED to become aggressive to the player who shot it. ZED might become aggressive to the player it was initially targeting. Not enough time passed since the last enemy change time (min - 5s). New potential enemy already targeted by at least 3 other ZEDs. ZED is currently doing melee attack. Current enemy is within ZED's strike range. ZED has LOS on its current enemy and that enemy is also closer to ZED than its new potential enemy. If ZED can see current enemy and cannot see its new potential enemy. ZED does not have LOS on its current enemy. Distance to current enemy is 20% greater than distance to the new potential enemy. Path to current enemy is blocked by the new potential enemy that has also scored damage that is at least 10% of ZED's maximum health. If ZED seeing its new potential enemy, new potential enemy is targeted by less than 3 other ZEDs and "ZEDs targeting current enemy / ZEDs targeting new potential enemy" ratio > 0.5 (evaluation of this event begin when ZED get closer than 15m to players, radius to check how many other ZEDs are targeting players - 10m around each player). I.e. first ever hit to ZED that has 100+ HP from the other ZED will do twice more damage, all further hits will only be doing less damage since the multiplier declines with the HP loss. This formula works based only on ZED's current health - as soon as HP drops below 100, this ZED starts taking normal amount of the damage without additional multipliers. ZEDs attack within certain range, attack itself has its maximum execution range. Each ZED has a set of attacks (animation set) that it can execute. Each attack can be performed under the certain conditions including maximum and minimum range of attack. Within that range ZED will be evaluating a possibility to perform such attack. Attack animation itself has the maximum range where it does damage (i.e. making contact with the player). Depending on the game difficulty ZEDs getting specific odds to execute weak / medium / hard attacks. These types have nothing to do with the damage inflicted but rather defy complexity and amount of the possible moves, i.e. on harder difficulties ZEDs getting more of available attacks. There are various factors to determine whether ZED can perform certain attack or not - chance, difficulty limits, maximum and minum range of attack, cooldown, only when / when not X (X - moving, sprinting, enraged, surrounded, headless, cloaked etc.). On higher difficulties ZEDs have wider variety of attacks that they can possibly execute. It should be noted that animation set is a static object and is shared between all the ZEDs of the same type (e.g. all Scrakes or Husks use the same static list of attacks they can pull out) unlike, for example, health or movement speed which are rather handled on the per-ZED basis. If certain attack in the list has global cooldown and one of the ZEDs has already played it recently, the game writes time stamp next to this attack and all the other ZEDs around have to wait for this cooldown to expire before attempting to play it again. As for global cooldown, nearly all of the ZED's melee attacks have it, common cool downs varying in length of 2-10 seconds, but might as well be shorter for some ZEDs and greater for others. Due to complexity and influence of randomness, this wiki does NOT contain detailed information on each attack and its conditions, especially implying that without visual representation it will be hard for readers to figure and match names and numbers. For such purposes players may individually examinate ZED's animation sets and "_AnimGroup" archetypes in Killing Floor 2 SDK as well as query the information in a text form (yet again without visual representation) by typing in console "GetAll KFPawnAnimInfo Attacks". There are 2 types of ZEDs melee attacks: 1. Impact Attacks, generally performed by the weak ZEDs (Clots, Crawlers, some of the Stalker attacks) - basic "one-target-at-time" type of attacks. To do damage by these attacks, ZED should face its enemy, ZED's target should be within melee attack range and not blocked by obstacles. 2. Swipe Attacks - an "AOE-within-cone-shaped-segment" type of attacks. These attacks can do damage to multiple targets within designated area - forward, forward-left, forward-right, backward etc. Mostly used by medium-to-big ZEDs like Gorefasts, Scrakes, Fleshpounds. Much like Impact Attacks, Swipe Attacks requiring to-target-LOS-clearance and can only collide with the players within melee attack range. Player-controlled ZEDs do Area Melee Attacks. These attacks perform collision checks within ~174,2 degrees cone segments (87,1 degrees to both sides from the player's view direction). Area Melee Attacks will not register if Z-axis difference (height) between ZED and its victim will be greater than ZED's collision cylinder's height x 1.5 (for better representation "getall kfpawn location", Abs(VictimLocation.Z - Instigator.Location.Z) > Instigator.CollisionHeight x 1.5). Melee damage inficted to human players DOES NOT scale over the distance. It either does or does not happen. All Clots can perform a grapple attack. Grapple is a special move. Grapple prioritized over normal attacks, evaluation of possibility to perform a grapple attack happens each time Clots performs a melee attack. Different Clots has different odds to perform a grapple attack. Maximum distance to play grapple start animation and succeed is 2.1 meters. Breaking grapple causes stumble. Clots cannot end grapple by taking damage from other ZEDs, only players can break it. Grapped players are forced to look at the Clots, although there is an option to turn force look off. Grapple Odds (instead of normal attack): Cyst - 80%, Alpha Clot - 33%, Slasher - 38%. Mimimum interval between grab attacks - 5 seconds. Clots cannot grab the player for 1 second after grenade throw. Clots cannot grab the player for 0.5 seconds after shooting the healing dart. Calculate damage in weapon-specific formula - relevant for melee weapons that adjust damage values based on the swing direction. Berserker's Smash or Massacre bonuses for hard and light melee attacks are calculated in this step as well. Pure horizontal melee strikes do never more than 75% and never less than 50% of the base weapon damage depending on the view angle - the closer target to player's view center the more damage it will take. For horizontal melee strikes: Damage = Rounddown (Base Damage x (0.75 to 0.5 scale)), then for all melee strikes: Damage = Round (Damage x Smash OR Massacre Mod). Outcome is an INT. Calculate damage to hitzone. Outcome is an INT: Damage = Rounddown (Damage x Hitzone Scale). Take weakness or resistance on account. Outcome is an INT: Damage = Rounddown (Damage x Damage Type Mod). Apply ZED's block damage modifier. Outcome is an INT: Damage = Rounddown (Damage x Melee OR Damage Mod). Note: ZEDs have separate multipliers when blocking melee and non melee damage sources. Modify damage in perk-specific formula (apply passive damage bonus and skill effects). Passive and skill bonuses are additive, damage multiplied by the sum of all active skill bonuses. Damage = Round(UP) (Damage x (Perk Bonus 1 + Perk Bonus 2 + Perk Bonus 3 + ETC...). Outcome is an INT value, either ROUNDED our ROUNDED UP - ROUNDED for Berserker, Demolitionist, Support, Firebug, SWAT and Survivalist and ROUNDED UP for Commando, Gunslinger and Sharpshooter. Check if player has Field Medic's Focus Injection buff. Outcome is an INT: Damage = Roundup (Damage x Focus Injection Mod). Calculate new value Extra Head Damage = Damage + ZED's Max Health x 0.25. Note: Extra Head Damage for Shotguns calculated presuming that 7 pellets hit (regardless from amount of the actual pellet hits). Apply steps 1-6 on the Extra Head Damage value. Combine adjusted Extra Head Damage and Damage values in order to recieve a final damage value that will applied on ZED upon decapitation. Damage Type Resistance: ZEDs are slightly less resistant to damage types that have Damage Scale < 1 in solo games (when there is only one player at server). Actual resistance value of the given damage type interpolated as Lerp (1, Damage Mod, 0.75). For example Fleshpound's resistance to Ballistic_AssaultRifle is x0.5. When there is only one player at server, it become Lerp (1, 0.5, 0.75), i.e. (1 - (1 - 0.5) x 0.75) = 0.625. Damage type multipliers of x0 are not an exceptions for this rule - if ZED does not take any damage at all, is solo it takes Lerp (1, 0, 0.75) = 25% of it. Such as Abomination Spawn does not take any toxic damage at all in co-op games but does take 25% of it in solo games. Trivial note: when all the damage calculations are done and ZED dies, its last particular hit zone to take damage (head, arm, leg etc...) takes 3 times more damage to gore health than FINAL DAMAGE value. This has no impact on gameplay, because ZED is dead already. Gore health is a variable that defies amount of health for a cetain hit zone, it mostly used for after-dead dismemberment. The only gore health variable that matters is head health, but as said by this moment ZED is dead anyway. ZEDs has base damage values that are being adjusted by different modifiers. ZED attacks are complicated mechanism. During each attack animation ZED might perform one, two or multiple hits. Some attacks has AOE. Depending on attack animation ZED's base damage value will be adjusted by one of the possible damage multipliers. Every single attack has its own damage multiplier. If attack animation involves multiple amount of the hits, each of them might also have its own damage multiplier (opposite to that, all the hits within attack animation might have same damage multiplier). At least 1 point of the damage will be done to the player with every single hit. For ZEDs there are different damage multipliers vs. players when playing solo or co-op. ZED has separate damage multipliers against players and doors. Generally ZEDs do more damage to doors due to higher damage multipliers. ZEDs are able to evade AND / OR to block certain damage sources. Slasher. Chance to evade after taking damage: Normal - 0.1, Hard - 0.4, Suicidal - 1, HOE - 1. Health loss percentage to trigger evade: all difficulties - 0.01. Bloat. Chance to block after taking damage: Normal - 0, Hard - 0.1, Suicidal - 0.65, HOE - 0.85. Health loss percentage to trigger block: all difficulties - 0.1. Block chains (max): Hard - 4, Suicidal - 5, HOE - 8. Block duration - 1.25s, cooldown - 3.5s. When blocking. Damage resistance: Melee attacks - x0.9, Gun attacks - x0.9. Affliction multiplier - x0.2 (ZED takes only 20% of all incoming powers). Solo game block chance multiplier: Hard, Suicidal - x0.1, HOE - x0.2. Crawler. Chance to evade after taking damage: Normal - 0.1, Hard - 0.4, Suicidal - 1, HOE - 1. Health loss percentage to trigger evade: all difficulties - 0.01. Gorefast. Chance to block after taking damage: Normal - 0.2, Hard - 0.5, Suicidal - 0.75, HOE - 0.85. Health loss percentage to trigger block: all difficulties - 0.1. Block chains (max): Normal, Hard, Suicidal - 4, HOE - 5. Block duration - 1s, cooldown - 1s. When blocking. Damage resistance: Melee attacks - x0.8, Gun attacks - x0.8. Affliction multiplier - x0.2 (ZED takes only 20% of all incoming powers). Solo game block chance multiplier: Normal - x0.2, Hard - x0.3, Suicidal, HOE - x0.3. Stalker. Chance to evade after taking damage: Normal - 0.1, Hard - 0.4, Suicidal - 1, HOE - 1. Health loss percentage to trigger evade: all difficulties - 0.01. E.D.A.R Variants. Chance to evade after taking damage: Normal - 0.1, Hard - 0.4, Suicidal - 1, HOE - 1. Health loss percentage to trigger evade: all difficulties - 0.01. Scrake. Scrake has a chance to block upon taking damage or when being aimed at. Scrake has a chance to evade certain damage sources. Scrake cannot block when enraged. Chance to block after taking damage: Normal - 0.05, Hard - 0.1, Suicidal - 0.4, HOE - 0.5. Health loss percentage to trigger block: all difficulties - 0.05. Block chains (max): Normal - 3, Hard - 4, Suicidal - 5, HOE - 6. Block duration - 1.25s, cooldown - 5s. When blocking. Damage resistance: Melee attacks - x0.9, Gun attacks - x0.9. Affliction multiplier - x0.2 (ZED takes only 20% of all incoming powers). Solo game block chance multiplier: Normal, Hard - x0.1, Suicidal - x0.2, HOE - x0.3. Fleshpound. Fleshpound has a chance to block upon taking damage or when being aimed at. Fleshpound has a chance to evade certain damage sources. Fleshpound cannot block when enraged. Hans Volter. Chance to block after taking damage: Suicidal, HOE - 0.3. Health loss percentage to trigger block - 0.1. Block chains (max): Suicidal - 5, HOE - 6. Block duration - 1.25s, cooldown - 7s (Suicidal), 6.5s (HOE). Affliction multiplier - x0.2. Damage multiplier (melee, firearms) - x0.7. Chance to evade after taking damage: Normal - 0.05, Hard - 0.1, Suicidal - 0.2, HOE - 0.2. Health loss percentage to trigger evade: all difficulties - 0.01. Patriarch. Chance to block after taking damage: Suicidal, HOE - 0.85. Health loss percentage to trigger block - 0.1. Block chains (max): Suicidal - 5, HOE - 6. Block duration - 1.25s, cooldown - 3.5s. Affliction multiplier - x0.2. Damage multiplier (melee, firearms) - x0.9. King Fleshpound. Chance to block after taking damage: Normal - 0, Hard - 0.01, Suicidal - 0.2, HOE - 0.3. Health loss percentage to trigger block: all difficulties - 0.05. Block chains (max): Hard - 3, Suicidal - 4, HOE - 5. Block duration - 1.25s, cooldown - 6.5s. Abomination. Chance to block after taking damage: Normal - 0, Hard - 0.1, Suicidal - 0.85, HOE - 0.85. Health loss percentage to trigger block: all difficulties - 0.1. Block chains (max): Hard - 4, Suicidal - 5, HOE - 8. Block duration - 1.25s, cooldown - 3.5s. Abomination has a chance to block upon taking damage or when being aimed at. Abomination has a chance to block or evade certain damage sources. When blocking. Damage resistance: Melee attacks - x0.9, Gun attacks - x0.9. Affliction multiplier - x0.2 (ZED takes only 20% of all incoming powers). Solo game block chance multiplier: Hard - x0.1, Suicidal and HOE - x1. Block has its maximum duration and cooldown, solo game might have an additional block chance multiplier. When blocking ZED takes less damage (melee attacks have separate damage multipliers). Technically damage mitigation effect begin after 0.2 seconds since the block move started. There is a maximum amount of the blocks ZED can execute in a single block chain. If ZED currently blocking and takes damage that is enough to trigger a new block instance there happening block chain increment (initial block gives 1 on the block chain counter, 2nd block attempt (when initial block still active) gives 2, 3rd block attempt (when initial block still active) gives 3 and so on). Each block chain increment resets block duration. Upon exceeding the maximum amount of the block chains (Block chains (max) > value) block ends and ZED plays Melee hit reaction. Each next block sequence (after block cooldown expired) begin with the block chain counter of 1. Generally it is quite hard for ZEDs to chain blocks due to various factors - next block attempt during the current block has a CHANCE to appear upon depleting CERTAIN AMOUNT OF THE HEALTH which ZED looses at decreased rate due to BLOCK DAMAGE RESISTANCE. If ZED is allowed to sprint during the block animation, for the duration of block its sprint speed will be decreased by 25% (x0.75 multiplier). When ZED being aimed at with the Sharpshooter weapons, in such case it is necessary for player to ADS. Time for AI to recieve a warning (i.e. for how long player has to aim at ZED) - random (0.4-0.8)s. Maximum danger distance - 25 meters. AI warning evaluation interval - 0.1s. When certain projectile (pellet / bolt / blade) being fired there happening AI warning notification. Maximum danger distance - 20 meters from the projectile spawn location. AI warning notification happens only when projectile meant to land at the point which is not further than 1.28 meters away from the ZED's location. When ZED being hit. Evaluation interval - each time ZED takes accumulative damage equal to listed health loss percentage (already mentioned above). When ZED being aimed at with the flashlight. Evaluation interval - 1s. Maximum danger distance, from the player position - 20 meters. When ZED being attacked by melee weapon. Only relevant for ZEDs that can block. Maximum danger distance - weapon hit range + zed collision radius. When ZED being attacked by fire weapon. Maximum danger distance, from the player position - 10 meters (15 meters for the Microwave Gun). AI warning evaluation interval - each 0.5s of the continuous weapon firing. When ZED nearby the Ground Fire. Minimum danger distance, from the Ground Fire location - 3 meters. When ZED is at line of Husk's fireball attack. Small ZEDs (Clots, Crawlers, Gorefasts and Stalkers) will attempt to evade when warned of being run over by big ZEDs (Scrake, Fleshpound, Patriarch). ZEDs has separate values of the body health and head health. Damaging body will not be damaging head BUT damaging head will also apply damage to the body (hitzone multiplier should be applied in that case). Damage from explosive weapons applied to the body health, head health will not be taking any damage from explosives (unless it is a direct hit from the projectile). Amount of the health and head health for each next spawned ZED depends on amount of the LIVING players. Players joined the game but not yet spawned will not contribute towards ZED's HP. When there is more than 6 players on the server, ZED HP begin to interpolate linearly. The maximum health cap multiplier (x20) can be achieved upon having 128+6 = 134 players at same time. Interpolation begin at the point A which is a ZED's Health Mod value of 6 players and ends at the point B = 20 which is health cap, amount of the interpolation is value of (Amount Of Living Players - 6 / 128). This interpolated value then being added to 1 to give the final health mod multiplier. Example 1: Gorefiend on the 10-man server. Gorefiend has constant amount of the health at sub-6-man server - 400, i.e. it does not go up when there is 1-6 players because Health Scale value per player for this ZED is 0. So HP begin to interpolate from 0 to 20 and amount of the interpolation is (10-6) / 128 = 0.03125. Lerp (0, 20, 0.03125) = 0 + ((20-0) x 0.03125) = 0.625. Final health multiplier is 1+0.625 = 1.625. At the 10-man server Gorefiend will be having 400 x 1.625 =650 HP. Example 2: Scrake on the 10-man HOE server. Per additional player Scrake gains 39% more health (Health Scale value of 0.39). Interpolation begin from 0.39x6 = 2.34 to 20 and amount of the interpolation is (10-6) / 128 = 0.03125. Lerp (2.34, 20, 0.03125) = 2.34 + ((20-2.34) x 0.03125) = 2.891875. Final health multiplier is 1+2.891875 = 3.891875. At the 10-man server Scrake will be having 1210 x 3.891875 = 4709 HP, where 1210 is amount of the health for 1-man HOE Scrake. Enraged or sprinting Fleshpounds (all variants) can do bump damage to ZEDs just by touching them (although ZEDs on their path will likely attempt to evade the threat). Base amount of the damage is 270, multiplied by x2 if Fleshpounds are sprinting and also multiplied by Fleshpounds' difficulty settings. All ZEDs take full damage, Scrake - only 10% of it, Quarter Pound - 25%, Fleshpound - 0%. If by the moment of bump ZEDs will be having less body health than incoming bump damage, these ZEDs will be knocked down if they would manage to survive (Rioters, for example, as their armor will absorb the damage). Otherwise, if ZEDs will be having enough health to survive the bump, instead they will stumble. Damaged ZEDs will consider their bumpers as an enemies if damage given by the bump will be at least 15% of the ZEDs' maximum health. In Hunt And Heal / fleeing / sprinting modes bosses can do bump damage to ZEDs just by touching them (although ZEDs on their path will likely attempt to evade the threat). Base amount of the damage is 270 multiplied by bosses' difficulty settings. All ZEDs take full damage, Scrake - only 10% of it, Quarter Pound - 25%, Fleshpound - 0%. If by the moment of bump ZEDs will be having less body health than incoming bump damage, there will be 40% chance for these ZEDs to die (get obliterated) and 60% chance to get knocked down without taking any damage. Otherwise, if ZEDs will be having enough health to survive the bump, instead they will stumble. Damaged ZEDs will consider their bumpers as an enemies if damage given by the bump will be at least 15% of the ZEDs' maximum health. Notes: ZEDs do not evade when being runover by Hans Volter. Patriarch does 10 points of damage when bumping into players while fleeing. ZEDs has vulnerable AND / OR resistant hitzones. Damage applied on these hitzones will be adjusted by listed damage multiplier. Hitzones are "additional" damage multipliers. If ZED resistant or weak to certain damage type and getting hit into certain hitzone, the total amount of the taken damage will be multiplied twice - by ZEDs resistance / weakness scale and by hitzone damage multiplier. For example when hit by Ballistic_Rifle damage type into the gauntlets, Fleshpound will be taking 0.75 x 0.2 = 0.15 (15% of the base weapon damage). Two ZEDs of the same type may have different movement speed. Each particular ZED has its own movement speed value. Movement speed can be deviated by up to -10%/+10% from the base speed value. Each ZED getting its movement speed value only once - upon spawning. This means that two spawned ZEDs of same class can has different movement speeds which will not change during the time these ZEDs alive. Movement speed also affected by difficulty mods. Player-controlled ZEDs does NOT have their speed adjusted by randomization. Base ZED's speed mods: Normal - x0.9, Hard - x0.95, Suicidal - x0.95, HOE - x0.95. Base speed mod further affected by the Game Conductor. Slasher speed mods: Normal - x1, Hard - x1, Suicidal - 1.1, HOE - x1.2. Crawler speed mods: Normal - x1, Hard - x1, Suicidal - 1.3, HOE - x1.4. Stalker speed mods: Normal - x1, Hard - x1, Suicidal - 1.3, HOE - x1.4. Abomination Spawn speed mods: Normal - x1, Hard - x1.1, Suicidal - 1.25, HOE - x1.25. All other - x1 / x1 / x1 / x1. Note: Whenever in the multiplayer (non solo) game there will be only one player alive, for every minute spent bosses (Hans Volter and Patriarch only) will be getting +20% of their movement speed, up to +30% at maximum. When hidden (not considered as relevant or not observed by players), ZEDs can move at Hidden Speed (aka Super Speed) which depend on amount of the living players. However in most cases ZEDs prefer to teleport shortly after entering "Hidden" mode. Last 3 ZEDs during the wave time are always relevant. Upon spawning each ZED getting its own Sprint and Sprint When Damaged chances - the values that used to determine whether ZED should or should not sprint under the proper conditions. Player-controlled Alpha Clots and Elite Alphas can rally boost nearby ZEDs. Rally-boosted ZED inflict more damage and (for certain ZEDs on certain difficulties) become able to sprint regardless from its pre-set settings. Rally boost has duration of 10 seconds. Chance to spawn as Elite Alpha: Normal - 0, Hard - 0, Suicidal - 0.25, HOE - 0.35. Alpha Clot has a chance to spawn as Elite Alpha. Elite Alpha able to rally boost nearby ZEDs. Rally evaluation happens when Clot sees the player. Interval to check for rally probability: When Clot sees the player a 2s + random (0-3s) timer starts, then for the duration of Clot-to-player LOS visibility evaluation happens within 1.5s intervals. Rally chance: Suicidal - 0.7, HOE - 0.8. Rally cooldown: Suicidal - 15s, HOE - 15s. Self damage dealt multiplier: Suicidal - x2.5, HOE - x2.5. To activate a rally there should be at least 4 nearby ZEDs (including Elite Alpha itself) within 10m radius. ZED spawn intensity changes depending on the various factors. ZED spawn intensity depend from the Spawn Rate modifier which itself depend from the Spawn Mod, Spawn Time modifier, Solo Spawn Rate modifier and Early Wave Rate / Late Wave modifiers (by default all values set to 1). These modifiers change their values depending on the game difficulty, wave number, amount of the living players and whether this wave is an "early" wave or not ("early" waves: Long = waves 1-4, Normal = waves 1-3, Short = 1st wave). The bigger Spawn Rate modifier is - the slower spawning happening and vice versa, the lesser Spawn Rate modifier is - the faster ZEDs spawning. By any means there is at least 1 second between spawns of two separate ZED groups. Spawn rate at "early" waves will be increased. Spawn Mod for "early" waves calculated as Spawn Mod = Spawn Time modifier x Solo Spawn Rate modifier x Early Wave Rate modifier. If current game is a solo game, ZED spawning will be slowed down. Otherwise Solo Spawn Rate modifier remains the same (1). Solo Spawn Rate modifiers: Short game, all difficulties - (wave 1 - 1.55, wave 2 - 1.65, wave 3 - 1.75, wave 4 - 1.80, wave 4 of normal game - 1.85), Normal game, all difficulties - (wave 1 - 1.55, wave 2 - 1.60, wave 3 - 1.65, wave 4 - 1.70, wave 5 - 1.75, wave 6 - 1.80, wave 7 - 1.80), Long game, all difficulties - (wave 1 - 1.55, wave 2 - 1.59, wave 3 - 1.64, wave 4 - 1.68, wave 5 - 1.72, wave 6 - 1.75, wave 7 - 1.78, wave 8 - 1.81, wave 9 - 1.84, wave 10 - 1.85). If current wave is an "early" wave, Spawn Time modifier changes to 1 for 1 player, to 1.3 for 2 players, to 0.9 for 3 players, to 0.7 for 4 players, to 0.4 for 5 players or to 0.3 for 6 players or more. Otherwise Spawn Time modifier remains the same (1). If current wave is an "early" wave, Early Wave Rate modifier changes to 0.8 (Normal) OR to 0.6 (Hard) OR to 0.5 (Suicidal and HOE). Otherwise (if this is wave is a "late" wave) Early Wave Rate modifier remains the same (1). Spawn rate at "late" waves will be toned down. Spawn Mod for "late" waves calculated as Spawn Mod = Spawn Time modifier x Solo Spawn Rate modifier. At "late" waves Spawn Time modifier changes to 1.1 for 1 player, to 1.45 for 2 players, to 0.9 for 3 players, to 0.8 for 4 players, to 0.7 for 5 players or to 0.6 for 6 players or more. Solo Spawn Rate modifier taken from step 1.1. After getting the Spawn Mod (from either step 1 or step 2), game multiplies it by Difficulty Spawn Rate modifier. For now on all difficulties Difficulty Spawn Rate modifier has a value of 1, i.e. has No impact on the spawning. As a final step game calculates Spawn Rate modifier as Spawn Rate modifier = Spawn Mod x Spawn Rate Intensity of the Game Conductor. Furthermore, overall spawn intensity depend on the map. Each map has its own specific value that used for calculation of the next spawn time. Lower value means faster spawning. Each map has its own specific value (Wave Spawn Period) which sets the base interval between ZEDs spawns. The lower value meaning faster spawning. The values below are NOT exact times between spawns, they are a subject of change via "ZEDs - Spawn intensity" mechanic. AI might stuck due to obstacles or lack of waypoints. AI tends to evaluate and handle the stuck. ZEDs use complicated mechanism to evaluate their stuck possibility when moving to players. Within constant intervals ZEDs check if it is needed to add certain amount of the StuckPossiblity to their stuck meter. Some actions however marks ZEDs as completely unstuck. Upon reaching the StuckPossiblity meter of 5 or higher ZEDs will handle the stuck. ZEDs use different methods to get unstuck. ZEDs does not evaluate stuck possibility before beginning of the game and after it ended. For the next 5 seconds after playing the melee attack animation ZEDs considered as completely unstuck. StuckPossiblity become 0. For the next 5 seconds after teleporting ZEDs considered as completely unstuck. StuckPossiblity become 0. For the next 5 seconds after performing any special move (attack, stumble, knockdown, scream etc.) ZEDs considered as completely unstuck. StuckPossiblity become 0. If ZEDs are not further than 10 meters away from the players AND there are at least 5 AIs remaining throughout the wave, these ZEDs considered as completely unstuck. StuckPossibility become 0. If ZEDs has path to the player (at least one waypoint is cached), they considered as completely unstuck. StuckPossibility become 0. If ZEDs are waiting outside of the closed door while other ZEDs trying to break though, they considered as completely unstuck. StuckPossibility become 0. If ZEDs are not moving in the X|Y axis, StuckPossibility being increased by +0.5. If ZEDs are moving up / down (jumping in one place) StuckPossibility being increased by +1 (by +2 if ZEDs are falling without Z-axis velocity). In order to prevent stuck, ZEDs has their collision cylinder size reduced while at the special areas of the map ("chokepoints") and when they have total StuckPossibility of 2.5 or higher. ZEDs handle stuck differently. Small ZEDs prefer to suicide and respawn at the spawn volumes. Scrake, Fleshpound and bosses cannot suicide when being stuck but rather teleport to the nearest waypoint OR (if there is no waypoints nearby) to the spawn volumes. Some ZEDs can teleport when not observed by players. When hidden (not observed by spectators, not visible and not audible to players) ZEDs can initiate a teleportation to the nearest "best" spawn volume from the players. Observing ZEDs through walls and objects prevents them from becoming hidden for a short period of time hence prevents their teleportation. ZEDs updating their "last relevant time" variable within 5s intervals which is enough to trigger their teleportation. To make sure that certain ZED will not teleport closer, players should have it constantly appearing and disappearing within their LOS (line of sight) since this method forces ZED to update its "last relevant time" variable in intervals shorter than 5s - it is being constantly updated as long as players maintain LOS to this ZED. ZED teleportation being completely disabled when only 12 AIs remain during the wave time (except for Stalker - this ZED can teleport regardless from amount of the remaining AIs). Bloat, Husk, E.D.A.R, Siren, Scrake, Fleshpound and bosses cannot teleport at all.